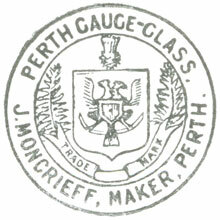 John Moncrieff Ltd. trademark used for the "Perth" brand of Gauge Glass. Registration number 2349 for Cape Colony (Now part of South Africa) dated 29th December 1904 — expired 1918. With thanks to Colin Mayor - John Moncrieff Ltd. from Engineering Apprentice 1962 to Technical Director on leaving in 1996.